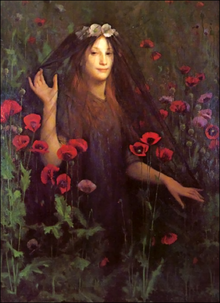 On holiday this year I visited the lovely Penlee House Gallery, hoping to see one of their (relatively) recent acquisitions: Ruby, by Thomas Cooper Gotch. Sadly it wasn’t on display, but I did buy a lovely postcard of it, and hope to see it next time I’m there. The gallery bought it with help from the Art Fund back in 2012. 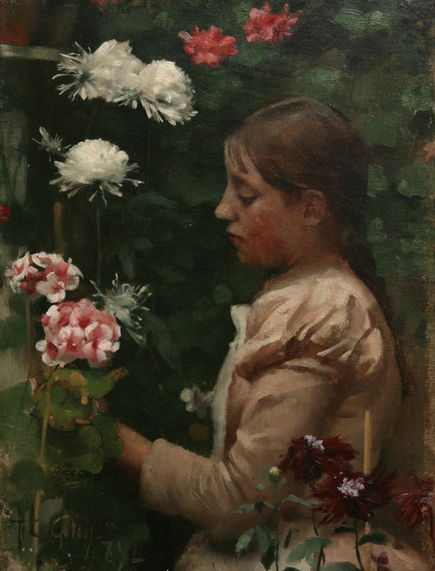 They already (I believe) have Gotch’s Girl in a Cornish Garden, a painting which cements his Newlyn School credentials as an artist, but Gotch changed his ideas and style of painting after some travelling: though he was instrumental in the founding of the Newlyn Gallery and very much a ‘plein air’ painter in the Newlyn style, he later became influenced by the Pre-Raphaelites and began to paint in the rich colours and crisp lines of the PRB. Ruby (c. 1909) is unusual in many ways. Gotch’s paintings tend to include a lot of children (such as the celestial Alleluia, in Tate Britain) and he paints them in jewel-like colours which make give the viewer the uncanny feeling that a child is standing in front of them. 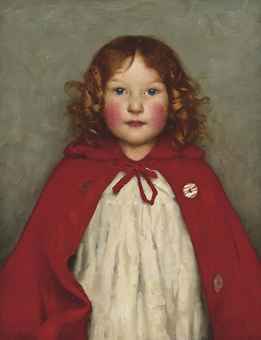 But Ruby (based on a local Cornish girl) is more than that: she is red-haired, like other Pre-Raphaelite women, and she is also scarlet-cheeked and clad in a crimson cloak – the painting, against a dull grey background, flames out like a beacon. As a redhead myself, I know there are assumptions that redheads shouldn’t wear red, but this little girl is deliberately defying it: she looks as though she has just been running through fields, with her tangled curls and bright face. In fact, Gotch painted Ruby Bone (who was about two) in response to a bet that he couldn’t – or wouldn’t – paint a red-head in red clothes (the Art Fund give more information on this here). Although Gotch is not a particularly prominent painter, his work is easily recognisable. 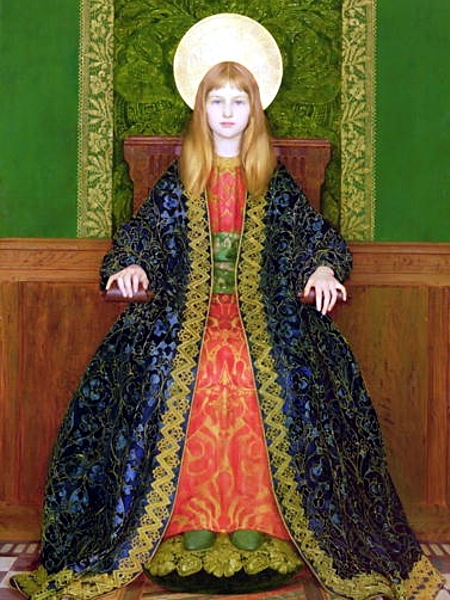 From the glorious, celestial, if somewhat uncanny children (most famously, The Child Enthroned) to his more Gothic imaginings (such as Death the Bride), his work demonstrates how different schools of art may collide and produce something entirely unexpected and often quite thrilling.